When we first heard about smartphone apps of constitutions, it’s fair to say that we were a little sceptical. Who would use their precious data allowance to download an app that made it easier to search through a dry legal document? Well, in the case of Nigeria the answer is ‘more than half a million people so far’. The fact remains that in many African countries, constitutions – the basic legal underpinning of a state – are difficult to access, let alone understand. 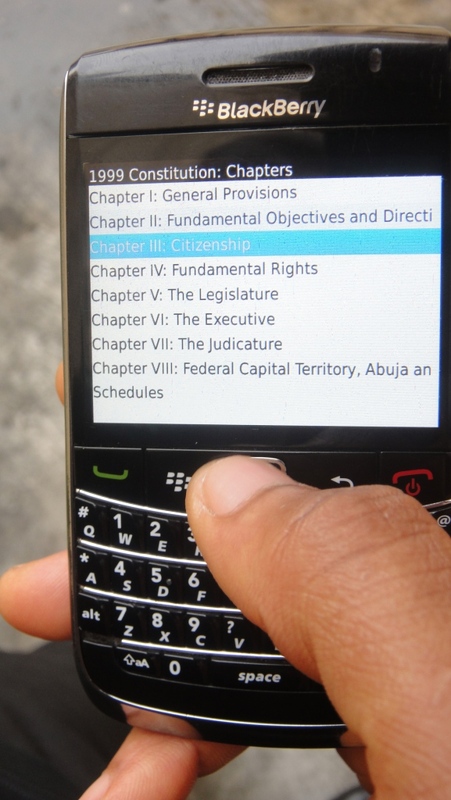 In societies where mobile is king, a mobile-compatible version of a constitution is an incredibly powerful tool for lawyers, law students, activists and the general public. We’re delighted, therefore, to be able to provide a grant of £5,000 to Yougora Ltd. towards the development of an Android app for the Ghanaian constitution. The 233 Law project – of which the constitution app is a part – has been up and running for a while now and a basic version of the app is already available. This funding will cover staff and technical costs, while approximately half will be spent on promoting the app. As well as providing access to the Ghanaian constitution, the app will also include several key pieces of legislation. It will also incorporate a Q and A section, whereby members of the public can submit questions to be answered by lawyers from Legal Aid Ghana. We recognise that being able to access a constitution and other pieces of legislation does not mean that citizens will automatically be able to assert their rights. Yet the fact remains that the right to access a country’s legislation is a basic one and is a first necessary step. If this app proves half as popular as the Nigerian Constitution App then it’s fair to say we’ll be a happy bunch.